Often, the task of being a film reviewer is a pleasant one. I mean, there are many worse occupations in the world. Once a week, I get to watch the latest releases with a tub of popcorn in a comfy seat. The majority of the time, I have a blast and come out of the screen with a smile on my face or an emotional tear rolling down my cheek. And sometimes, I walk out in disgust thinking about what a waste of time the past two hours were. Serenity is such a film, the rare breed that makes me wish I was working down a coal mine instead. It’s been a while since I’ve seen something so truly awful, and the only saving grace of the whole experience is that I have a platform here to vent and get my teeth stuck in. Scathing reviews are so much more fun to write than positive ones. 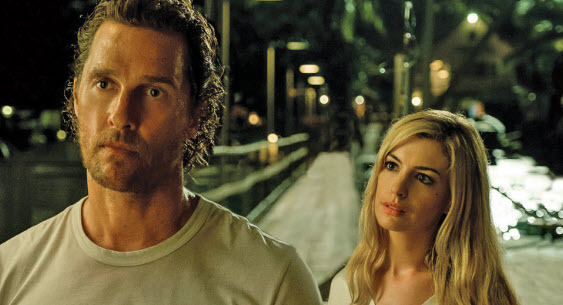 The New Year is not even a month old, but Serenity already qualifies as the worst film of 2019. I am absolutely, unequivocally certain of that. Both moronically written and directed with shocking, amateurish ineptitude by Stephen Knight, it’s a pointless bomb about the biggest tuna in the Caribbean and the foolish fishing boat captain who devotes his life to catching it. The result is a king-sized waste of time. The early months of every year are always devoted to the rubbish Hollywood couldn’t dump in the plethora of Oscar contenders the year before. One expects junk in January. It’s a rule. But it is rare to pull any junk movie from the gutter as spectacularly stupid as Serenity. Matthew McConaughey, who seems to have slipped back into bad habits again after his career renaissance a few years back, plays a boat captain with the silly name Baker Dill who ekes out a living taking tourists fishing on a boat called Serenity and lives in a cardboard lean-to on an island called Plymouth. It is clear from first sight that he has serious issues. So flat broke that he can’t even afford petrol, he tells off his customers, pulls a knife on his loyal first mate Duke (Djimon Hounsou), chain-smokes anything he can light with a match, brawls his way through the island bars and drinks himself unconscious every night. Miraculously, he also has a girlfriend, played by a terminally-wasted Diane Lane, who serves no purpose except to provide him with repeated opportunities to show off his chiselled torso. There isn’t a shred of passion between them. He also has no plumbing, so to take a bath he sometimes goes full monty and jumps off the top of a cliff into the sea to show even more of his gym-pumped abs. Unfortunately, it doesn’t match his ravaged face. He looks embalmed. Just when you think you can’t bear another minute of monotony, Baker’s ex-wife Karen (an abysmal Anne Hathaway) shows up out of the blue and offers him $10 million if he’ll take her abusive, one-armed billionaire husband Frank out into the middle of the ocean on the Serenity and feed him to the sharks. Years ago, Karen dumped Baker and traded him for money. Now she realises it was a mistake. Frank, the sadistic, alcoholic brute she married, beats her up regularly, and now she wants freedom for herself and Baker’s 13-year-old son Patrick, whom he has never seen. The point where the movie starts to seriously fall apart (if it was ever wholesome in the first place) is the intrusion of another weirdo who interrupts what weakly passes for a plot by pretending to sell Baker a magical ‘fish finder’ that can help him locate the giant tuna he sacrifices everything to catch. This skinny little creep (Jeremy Strong) wears dark business suits and no shoes, wading through the surf in his bare feet predicting ominous things to come. As the movie turns into a long, exasperating episode from The Twilight Zone, the dialogue induces giggles and then loud guffaws. As for the plot twists, they’re so ridiculous they appear to have been doodled on a notepad in a ‘sci-fi for beginners’ brainstorm class, and have more holes than a Swiss cheese. Honestly, this film isn’t in the ‘it’s so bad, it’s actually good’ category, where it might be worth a watch for the silliness of it all. It’s just a rotten carcass. In fact, earlier I said this will definitely be the worst film of 2019. I’d like to change my stance … I can hand-on-heart claim that this is categorically the worst film I’ve had the displeasure of reviewing in my five years at GulfWeekly.